Whether the objective is to enhance the performance of components, reduce costs or counteract the limited availability of raw materials, reliable alternatives are much sought-after in many industrial applications. This article examines the greater process efficiencies possible through tailor-made structure using hybrid-mesh. Hybrid meshes is an application-specific combination of different materials in one structure enabling process improvements to be made. By combining the physical properties of the materials used, GKD’s mesh structures aim to realize optimization potential for individual customers with their customized performance spectrum and previously unknown product properties. Alongside all metals and polymers, materials such as aramid, ceramic, glass, natural products or textile fibers is also weaved. The manufacturer’s intention is to use all industrially weaveable materials for such hybrid combinations depending on each individual case. Monofilaments, multi-filaments or wires made of these materials can be weaved into single-, multi-ply, and if required even multidimensional, mesh structures. These expand the possible range of deployments and performance of conventional solutions. Hybridization offers two possible applications for nonconductive basic mesh designs. As such, a matrix of conductive materials can be integrated to act as Faraday components in order to provide shielding from electromagnetic radiation. Electrostatic charging is avoided or dissipated using specific material combinations. This not only prevents the process-based risk of fire or explosion: in fluid and gas filtration these hybrid meshes also prevent electric fields from forming that negatively impact flow mechanisms or filtration rates. Hybrid meshes also offer added value in wear-intensive bulk-volume applications such as filtering process fluids. Here, perfectly tailored metal-plastic combinations can save costs while at the same time extending service lives. Moreover, an increased plastic content also reduces weight. For heavily loaded surfaces, for example the corners of filter leaves, resistance is improved through the partial use of hybrid mesh. To this end, warp or weft sections can be weaved in metal instead of in plastic. Solutions that combine a certain number of plastic wires with metal wires at defined intervals in the weft direction have proven effective in practice. Through the use of different materials in multi-ply meshes, properties are added at the exact points in the mesh at which they are required. In highly corrosive processes, hybrid meshes offer alternatives to structures made up of expensive raw materials with only limited availability such as Hastelloy or titanium. Here, a basic metal structure is combined with a polymer material such as PTFE in a YMAX weave which, unlike a pure metal structure, also achieves finer filtration rates more reliably. Another positive effect is that material costs are lowered by around 50%. Further typical examples of the process advantages offered by hybrid meshes are compatibility with flexing cycles to fit the process in question, mechanical strength, temperature resistance or surface properties individually adapted in line with adhesion properties or cleaning behavior. Furthermore, the plastic or elastic forming properties can be altered in certain directions by selecting specific materials and changing the diameter of the metallic cross section. This makes hybrid mesh appropriate as a high-performance shatter and fracture protection solution. The possibility to integrate desired materials into flat structures as meshes when shaping them is still relatively unknown. Because the material does not change during the weaving process, such hybrid meshes can offer a solution in particular when the customer requires a specific material for their application. The resulting mesh is not only breathable, permeable, even and oriented; it can also be subjected to downstream processing stages without any problem. When it comes to substituting complex coating, through hybridization, the mesh is given the required properties in a controlled and reproducible way. Limited dimensions become a thing of the past, as are the considerably higher costs associated with a coating procedure. Despite the advantages of hybrid meshes, this type of product is often not considered by potential users. One reason for this is probably a general lack of knowledge of weaving technologies and their fields of application. As a result, the option of hybridization is unknown. The success of all meshes is based on their application-specific development. As such, the virtually limitless range of materials that can be integrated in hybrid meshes expands the range of solutions offered by conventional metal or synthetic mesh. The only factors limiting the combination of materials are the customer's specific application conditions. 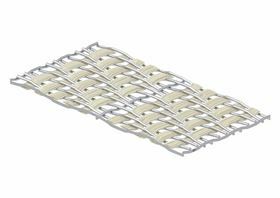 Ceramic in weaveable form is used to create custom-developed hybrid mesh using high-end weaving technology. A loom that can mix up to ten material components in a single mesh plays a key role here. The machine combines up to four, or where necessary eight, different materials in the weft direction, either as wires, cables or fibers. Two further materials can then be processed in the warp direction during the weaving process. Furthermore, the number of heald shafts and the corresponding control technology open up virtually unlimited possibilities in weaving technology. The initial question from many customers is always whether the task can be solved using mesh and which application-specific conditions are to be taken into account. The feasibility of the solutions proposed by GKD’s development department is tested by technicians with regard to material selection, weave type, mesh width and machine availability. Weave- and design-related questions can be answered using simulations. For this purpose a model is created in the integrated simulation environment GeoDict to calculate properties such as strength, permeability or thermal conductivity. If the developed solution meets the customer's technical and economical expectations, the first test weaves are performed. The amount of time required for the realization of the finished solution depends on the warp type, the material properties and machine availability. While the preparation of a second warp can take up to six weeks, it is possible to weave up to three different samples in a single day if only the weft material is changed and the corresponding loom is available. End-to-end weaving expertise and an integrated production environment, often means that a custom-developed hybrid mesh is theoretically ready for series production within just a few months; on the condition that the customer also validates the series maturity at a correspondingly early stage. As such, hybrid meshes from GKD offer a variety of interesting options for improving the efficiency, reliability and cost-effectiveness of processes and products. GKD will showcase its portfolio of filtration mesh for the treatment of waste and process waters at IFAT 2018 on 14-18 May. GKD will present its latest filtration innovations for municipal and industrial water processing. Thanks to the application-specific combination of different materials in one structure, GKD’s hybrid meshes have improved resistance. With the three-dimensional high-performance mesh, GKD offers a filter medium which has high flow capacity and retention rate.